Hundreds of households in a commune in the Tay Nguyen (Central Highlands) province of Dak Lak fear that they and their crops could be harmed after a wild elephant killed a local man last Sunday. Tran Van Tu in Ea H\'leo District\'s Ea H\'leo Commune was killed by a wild elephant last Sunday when he and Ha Van Thuat, who also lives in Ea H\'leo Commune, were on their way home after working in their fields. Tu and Thuat were walking on a footpath when the elephant suddenly appeared on the road about five metres away and chased them. Thuat ran to the fields nearby and escaped, while Tu ran on the footpath and was killed by the elephant. Luc Thi Lien, Tu\'s neighbour, said after hearing about Tu\'s death, she rode a motorbike to the scene of the accident, but the elephant chased her away. Local residents used 20 motorbikes to create noise by operating their engines at full capacity and blowing their horns, but they still could not chase the elephant away from the scene of the accident, Lien said. Finally, local residents used an automobile to chase the elephant away. Incidents of wild elephants destroying crops and tents in fields in Dak Lak have been occurring for several years, but this was the first time a wild elephant had killed someone, Lao Dong (Labour) newspaper reported. Mai Thi Lien in Ea H\'leo Commune said: "I have 3ha of cashew and cassava and every year wild elephants damage my crop, but this year it has been even worse." "Previously, wild elephants only visited my fields at night, but now they come during the day," she said. 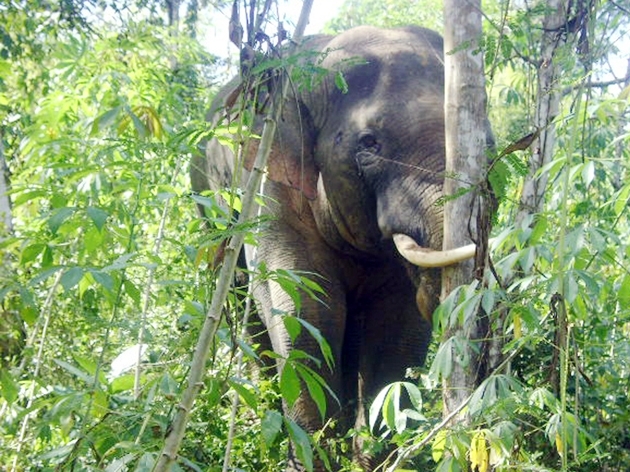 Le Trong Trinh, chairman of the Ea H\'leo Commune People\'s Committee, said after the death of Tu, commune authorities and forest rangers could only warn residents about the danger of wild elephants and instruct them in measures to chase them away. The area where wild elephants appear has about 300ha of cashew and 200ha of cassava. About 150-200 farmers stay at night on cashew and cassava fields. Dak Lak authorities should have drastic measures to protect the safety of local people and their crops, he said. Meanwhile, two wild elephants in Na Lau Valley in the central province of Quang Nam were allegedly killed by poachers and their tusks were taken away, Tuoi Tre (Youth) newspaper reported. However, local authorities and forest rangers did not know about this incident. Local residents said they heard several gun sounds in the area where the two wild elephants were later found dead in Na Lau Valley in Nong Son District\'s Que Lam Commune. Phan Nhu Thach, director of the Quang Nam Province Police Department, said on Tuesday that his department had not received any report about the death of the two elephants. If the two wild elephants were killed, agencies would investigate this case, Thach said. The Nong Son District Forest Protection Bureau in cooperation with the Que Lam Commune Police, on Tuesday began to carry out an investigation about the elephants\' deaths.